Ryan Pierson chose Detroit PAL for Gatorade Donation! 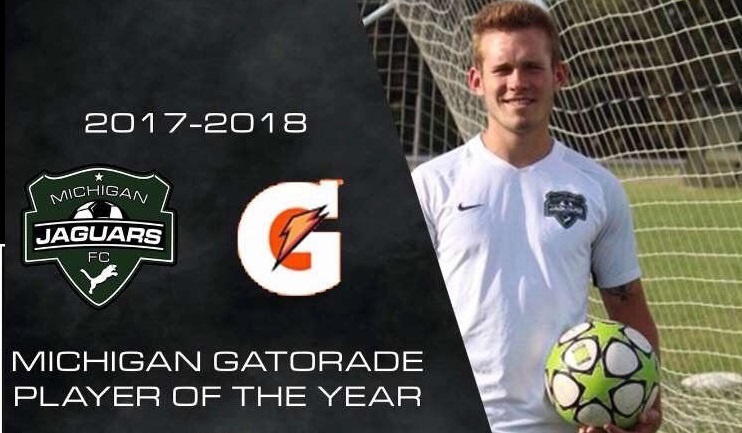 Ryan Pierson was named this years’ 2018 Michigan High School Gatorade Player of the Year for soccer. As a reward, the Plymouth senior from Detroit Catholic Central High School was given the opportunity to choose one non-profit organization to donate $1,000 to from Gatorade. “It feels good to win that award. There was a little bit of rivalry between me and another player who won Mr. Soccer, but I’m glad I beat him,” said Pierson. Ryan says that when it came time to picking the non-profit organization to donate the reward, he knew he wanted it to be somewhere close to home. Ryan says he was encouraged by his family to make sure to give back to an organization that’s close to home, instead of somewhere far away. Ryan says his parents were key contributors in the development of his success, sacrificing working long hours to pay for trips, tournaments, and traveling. He also said his coach always helped him improve and credits him as being the best coach he’s ever had. “I’d definitely want to come back and help out with the soccer program, especially when I’m not in school. I think it would be really cool,” said Pierson. In addition to winning the Gatorade Player of the Year Award, Ryan also led his team to their first ever state championship. He won All District and All Regional teams. Ryan was a part of the Dream Team, along with being an All- American for soccer. Ryan has received an offer to play soccer for the Saginaw Valley State University where he plans to major in Business. To keep up with Ryan and stay updated with his college journey, follow him on Instagram & Twitter at @ryanpierson17. Thank you, Ryan, for choosing Detroit PAL to donate to!